King prawn skewers with Moroccan tomato jam - home cooked food delivered. Fat, juicy king prawns with a fantastic savoury seasoning are paired with a Moroccan-style tomato jam which perfectly combines sweet and savoury North African flavours. 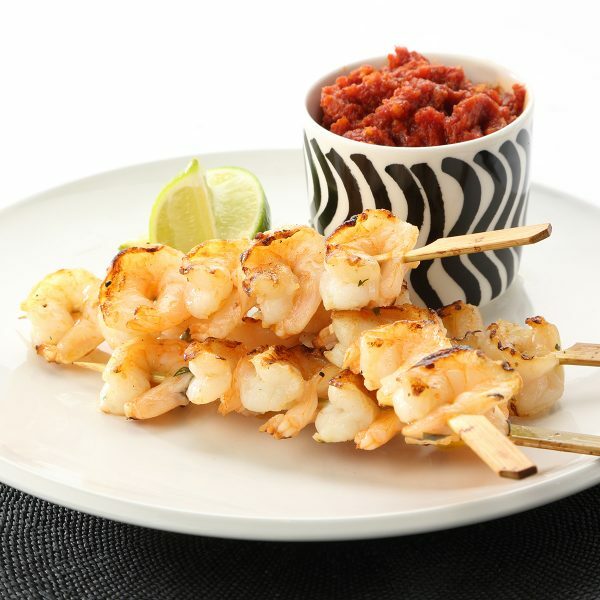 Kick off your dinner party in style with these king prawn skewers, or take nibbles to the next level and hand them out with a round of your favourite tipple! King prawns (CRUSTACEANS), garlic, fresh ginger, olive oil, cider vinegar, cinnamon stick, fresh coriander, plum tomatoes, soft brown sugar, cumin, cayenne pepper, ground cloves, seasoning.